Have I been in a bit of a soup-obsessed mood lately?... maybe. Or maybe it's just that when it's getting bitterly cold, the only way to fight back is to get in the kitchen and make a great big batch of soup! I was in the mood for something light, easy and heart-warming. I think this pretty much did the trick: a couple ladlefuls of chicken broth, a myriad of greens and some shrimp all simmering in the cradle of a wok. 10 minutes later... voila. Lunch is served my friends! Of course, in a more perfect world, I might have taken the time to enrich my stock with added chicken bones and aromatics. I might have added some chicken or sliced pork too. But as time was of the essence, I came up with this easy enough concoction and the result was quick and perfect. Cook the noodles according to package instructions. Run them under cold water once cooked, and reserve. 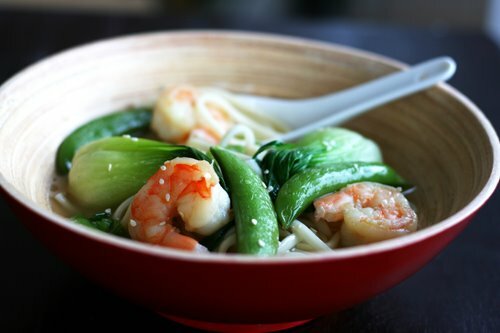 In the meantime, add the bok choy (cut in half lengthwise) and the sugar snap peas to a pot of boiling water. Boil for 2 minutes. Shock the vegetables by placing them in ice cold water. This stops the cooking process and helps the vegetables maintain a nice green color. Once the vegetables are cold, drain and remove excess water with paper towels. Heat your wok to medium low heat. Add the peanut oil, ginger, garlic and dried chili. Stirfry for 2 minutes. Add the peeled shrimp. Once the shrimp starts to turn pink, add the vegetables stirring constantly. Once the shrimp is entirely pink in color add the noodles. Add the chicken broth and bring to a boil. Once the broth has come to a boil, add the soy sauce, sesame oil and spring onions and cook for another minute. Serve topped with toasted sesame seeds. Enjoy! yum...this is looks so simple and satisfying. nice photo! Sometimes the simplest concoctions are the best, especially when prepared with the shared love of good friends in mind (or, at heart, to be precise). It's not quite bitterly cold here yet, but I cold enough that soup is still deeply satisfying. I'm looking forward to making this one at home! What a lovely looking soup! I love the shrimp and veggie combo! Looks like another home run to me! mmh - looks perfect for the flu which I've been trying to fight off past few days. Beautiful photo. MMmmm yum! Looks simple and delicious. Love the shrimp/bokchoy color contrast. It's hard not to be soup obsessed at this time of year. It's such a perfect thing to be eating. I love the vivid colors of that soup -- it looks so healthy not to mention delicious. We've had unusually warm weather, so I've been waiting a bit until it cools off to make soup. But this looks delicious - I want some for dinner tonight! That soup looks fresh and good! Might I ask what aromatics you might have chosen to enrich this recipe? Mari: If you have more time to enrich your stock you can use thyme, bay leaves, black perppercorns... and you can also add some carrots, onions and celery to make the stock more flavorful. Let me know if you try making the soup!